A Swiss man has returned home after battling the Islamic State – only to face prosecution for joining a foreign army without official permission. It comes as Western nations attempt to prevent would-be jihadists from heading to the Middle East. 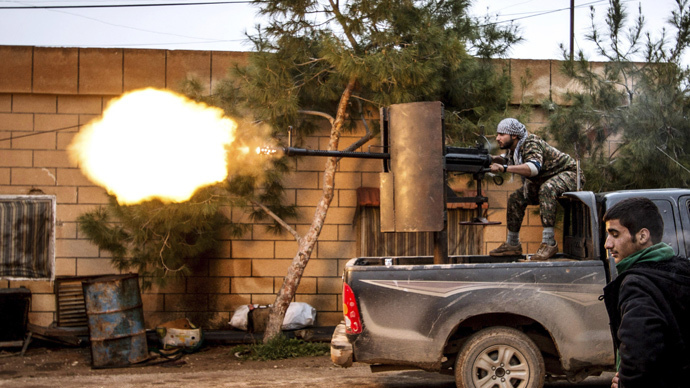 Johan Cosar, a 33-year-old Swiss national of Syrian Christian origin, was arrested in the city of Basel upon return to his home country, following two years of fighting alongside a Syriac militia in its battle against Islamic State militants, AFP reported on Thursday. Cosar, who is now free on bail, faces prosecution by Swiss military justice and a fine or three-year detention if convicted, according to police. This is on the grounds that he joined a foreign army without the authorization of the cabinet. Born in Switzerland, Cosar went to northeastern Syria as a journalist for Italian-language Swiss media, he told Le Temps newspaper last December. "I didn't go to Syria intending to fight," he said, as quoted by Swiss Info portal. "I found myself in the middle of a civil war, in a situation where you have to take up arms to protect yourself." He then met Syriac fighters and joined their cause. Syriacs – Middle Eastern Orthodox Christians who speak a form of Aramaic dating back to the 12th century BC – have been forced to leave their homes amid the extremist group's onslaught, along with thousands of others in Iraq and Syria. The UN Security Council is set to discuss the refugee crisis in the region at the end of March. Cosar used his Swiss army training to advise the militia – and even helped set up the Syriac Military Council. “I started looking at their lack of organization, so I began to give some tips to the Assyrian guys here on starting the militia, and that became my new role,” he told Foreign Policy magazine. “I didn't do anything against Switzerland and I'm sure the Swiss understand this,” Cosar told Deutsche Welle last year. UK citizens also previously left their country to join Kurdish groups, though there has been no official action against them so far. However, there has been increasing concern about radicalized Western nationals who head to Syria and Iraq in order to join the Islamic State, with many fearing they will return to launch Charlie Hebdo-style terror attacks. In the meantime, some countries in the EU has decided to give ‘second chances’ to returning jihadists who fought for the IS in Iraq and Syria. Denmark has introduced a rehabilitation program which gives the fighters from its country an escape route. It also helps them to get life back on track without the threat of prosecution. The UK endorsed the Danish idea of ‘IS fighter rehabilitation.’ William Hague, a British Conservative politician and former foreign secretary, said that the government will help British jihadists who return to the UK from Syria and Iraq, if they have “good intentions” about stopping others joining the conflict.